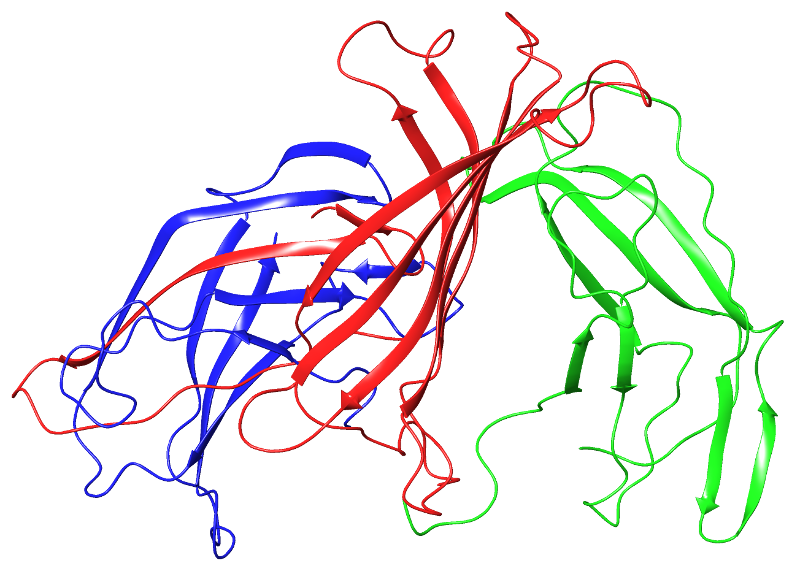 This part encodes a protein with two cellulose-binding domains on either end joined by a streptavidin domain. The idea behind this part is that each domain binds to a single cellulose fiber, thus providing a way to cross-link and strengthen cellulose polymers. In addition, the streptavidin domain allows for the modular addition of sensor cells with a biotinylated AviTag peptide (expressed on the surface of the cell by appending it to outer membrane protein OmpA). Figure 1. A schematic of CBD fusion protein and sensor cell surface protein complex interaction. The part was sequence verified before submission to the registry with two reads using VF2 and VR. Figure 2. The forward read using VF2. Figure 3. The reverse read using VR. We plan to assay the functionality of this part using a GFP construct inside a cell with the AviTag/OmpA surface complex. We will purify and apply our CBD/Streptavidin fusion protein to a cellulosic surface, followed by the above transformed cells, and attempt to wash off the cells using an isotonic solution. If the level of fluorescence does not change, we can assume our system has been successful. The 2016 Stanford-Brown iGEM Team purified this linker protein and used it to create a BioDevice. Used in tandem with a biotinylated fluorophore, this CBD/Streptavidin fusion protein served as a linker between cellulose paper and the fluorophore-quencher biosensor described here: http://2016.igem.org/Team:Stanford-Brown/SB16_BioSensor_FQsensor. Wash microcrystaline Cellulose five times in water. Then equilibrate in washing buffer (ammonium sulfate 1M). Pack the cellulose (10x10mm) in small chromatography columns (we used syringes barrels). Gently pour the lysate supernatant on the column. Once the liquid starts flowing through evenly, measure the OD280 of the different fractions. Continue pouring washing buffer until the OD280 stabilizes around zero. Change the washing buffer to water. OD280 shortly rises. Keep the fractions with the highest OD280 . They should contain the protein. Analyse collected fractions on an SDS-PAGE. Optionally, proteins may be concentrated using ultrafiltration. Figure 1. Purification of the chimeric Streptavidin-CBD protein on a cellulose column This elution graph shows a first peak, present for both the control and our expression culture. This first peak corresponds to unbound proteins. In the presence of water, only one peak was observed: it’s the elution peak of our protein. Affinity of the streptavidin-CBD encoded by BBa_K1934020 to cellulose was compared to the one of commercial streptavidin. A molecule of fluorescein was grafted at the 5’ end of a DNA oligo carrying a molecule of biotin at its 3’ end. This DNA oligo constitutes the reporter system. Such modified oligo was mixed either with the engineered streptavidin-CBD or with commercial streptavidin. The resulting mix was incubated with microcrystalline cellulose in presence of PBS for 1 hour. The cellulose was then washed twice with fresh PBS and fluorescence was measured. Every experiment was done in triplicate. Figure 2. The Streptavidin-CBD is able to bind biotin and cellulose. Mixed raw cellulose with our report system shows no fluorescence (first bar). 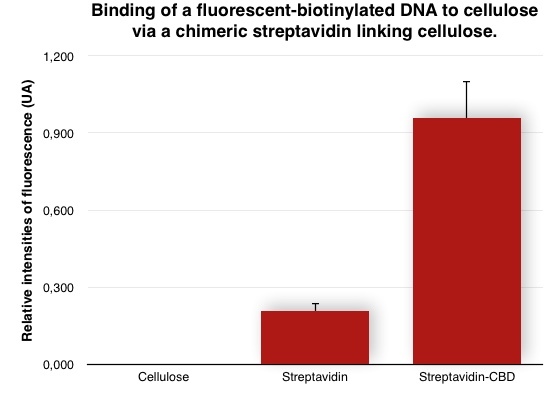 The measured fluorescence indicates that commercial streptavidin was able to bind our reporter system and sticks at a low extent to cellulose. We concluded that this results from none-specific adsorption. For the streptavidin-CBDs part (BBa_K1934020), a high fluorescent signal was recorded. 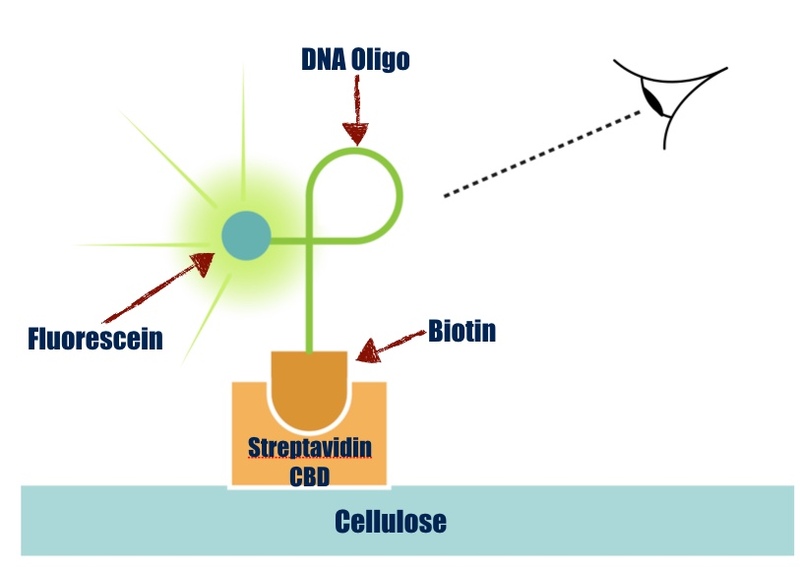 This experiment shows that this streptavidin-CBD protein is able to bind efficiently biotin and cellulose at the same time. The same experiment was done for the BBa_K1934030: part displaying a different cellulose binding domain, namely CBD-CipA. The binding efficiency of streptavidin-CBDs tends to be slightly lower compared to streptavidin-CipA (x1.1) but was not statistically demonstrated. We made a homology modeling as a confirmation of the working protein folding. The domains didn't seem well defined because of the hindered, but we still conserved the secondary structure of the protein. The use of a linker may be appropriate to allow a better efficiency. The part worked as specified for our needs! We cloned it in pSB1C3, with a pTac promotor, strong RBS and a double terminator. It is important to note that this protein tends to dimerize when it is over-expressed driving to a loss of function.